Photo gallery of electric dance music rapper SkyBlu in performance and casual situations. 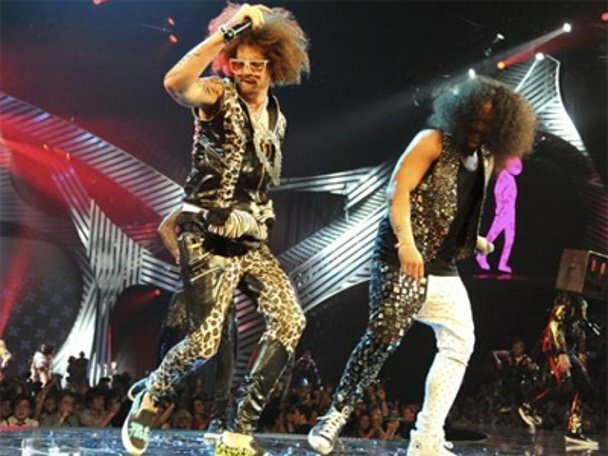 1 LMFAO SkyBlu in performance wearing a mismatched pair of black and white high top chucks. 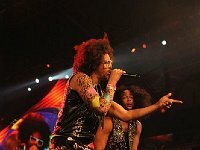 2 LMFAO LMFAO in performance. 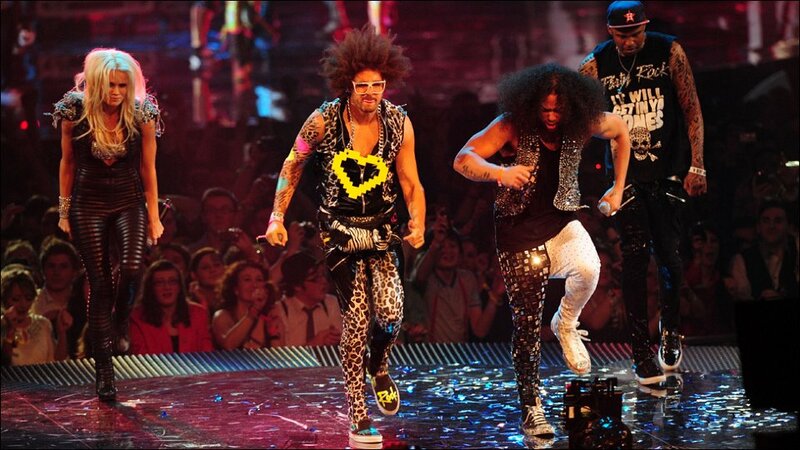 3 LMFAO Another performance shot. 4 LMFAO The band rocking out. 5 LMFAO Another performance shot. 6 LMFAO LMFAO at a photo shoot. 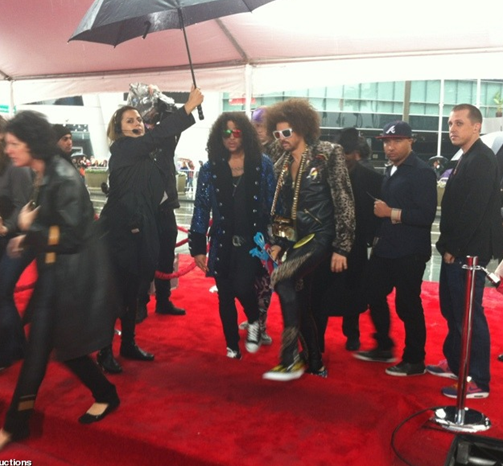 7 LMFAO Photo shoot at the MTV awards. 8 LMFAO Another posed shot. 9 LMFAO The band in performance. 10 LMFAO Another performance photo. 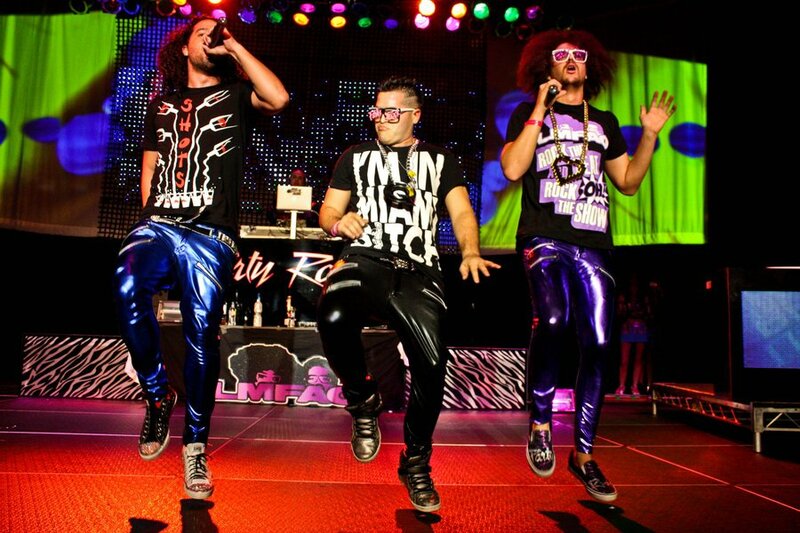 11 LMFAO SkyBlu in performance wearing a mismatched pair of black and white high top chucks. 12 LMFAO Casual photo of LMFAO. SkyBlu is wearing black chucks. 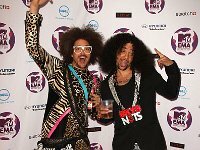 13 LMFAO Casual photo of LMFAO. SkyBlu is wearing black chucks, shot 2. 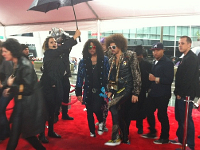 14 LMFAO LMFAO on the red carpet. 15 LMFAO Posed shot of LMFAO. SkyBlu is wearing a mismatched pair of black and white high top chucks. 16 LMFAO Posed shot. 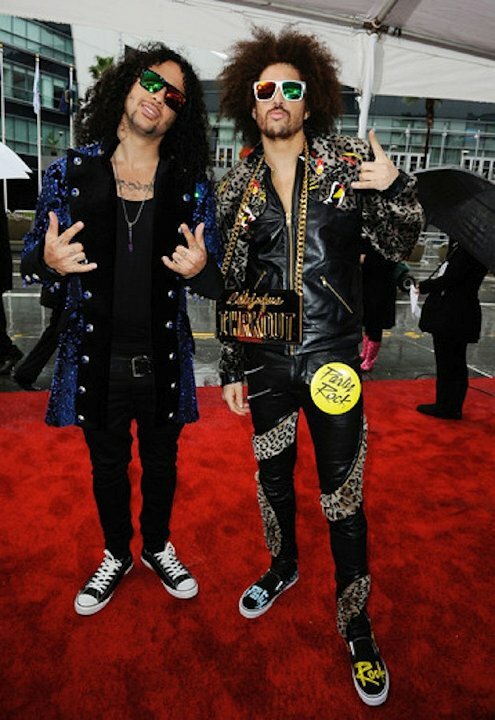 Sky Blu is wearing mismatched black and red high top chucks. 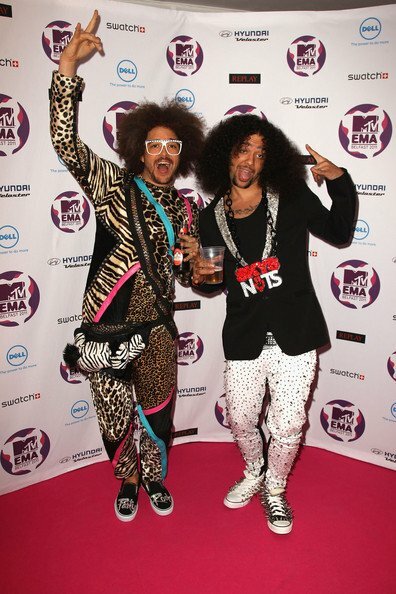 LMFAO is an American electric dance music rapper duo consisting of uncle and nephew Redfoo and SkyBlu. 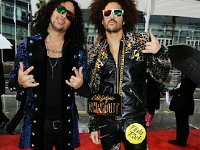 LMFAO are descendants of Motown Records founder Berry Gordy, Jr. RedFoo and SkyBlu grew up in the affluent Los Angeles neighborhood Pacific Palisades, where they formed the group LMFAO in 2006 and became part of the electro house scene. LMFAO started building a local buzz through their shows and radio play. 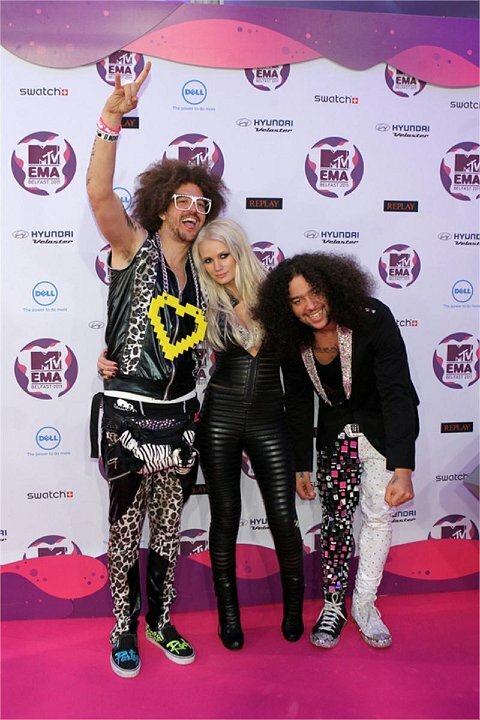 In 2010, they were featured on David Guetta's smash hit "Gettin' Over You", which charted all over Europe as well as the US, including reaching number one in the UK Singles Chart. 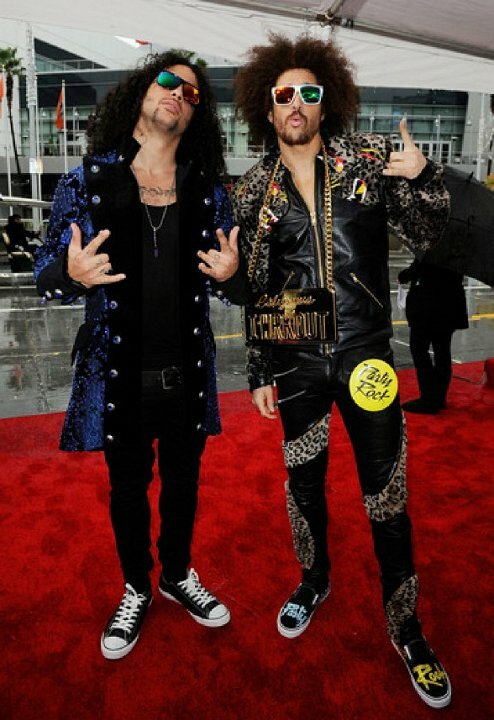 LMFAO are best known for their song "Party Rock Anthem".